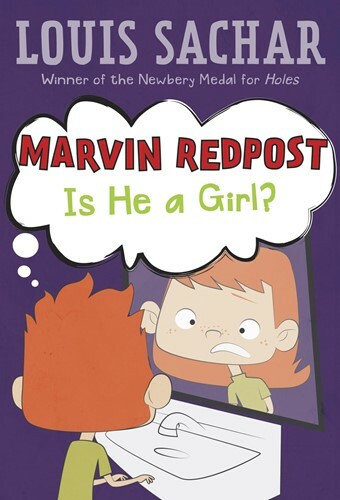 Marvin Redpost #3: Is He a Girl? This chapter book in Newbery Honor-winning and bestselling author Louis Sachar's Marvin Redpost series offers a sidesplitting take on the differences between girls and boys! When Casey Happleton tells Marvin that if you kiss your elbow you'll turn into a girl, Marvin doesn't believe it. Then Marvin kisses his elbow by accident and starts to feel very strange. He wants pigtails and starts dotting his i's with little hearts. Could Casey be right? Or is it all in Marvin's head? You decide! Hilarious and relatable, Marvin Redpost is perfect for kids who love to bond with quirky characters like George Brown, Class Clown and Junie B. Jones. From the Trade Paperback edition.